Do you have a connection to the Delmarva beaches? Can you be there on April 28? Do you love dogs? If so, read on! Hundreds of doodles (a doodle is a poodle crossed with another breed; for example, a golden retriever cross is a golden doodle and a Labrador cross is a labradoodle) will descend upon on Dewey Beach for a fun day of romping on the beach, all to benefit Food & Friends. We need volunteers to help with set-up, break-down, auction, and other tasks during the day. Amy Lane’s Fox Creek Farm, one of the first breeders of golden doodles in the United States, had organized a romp for doodle owners in Columbia, Maryland. After Arlo and his family attended, “the two Amy’s” had the idea of relocating the doodle romp to the beach and making it a “funraiser” for Food & Friends! It would capture so much of what Dan valued…Food & Friends, dogs, and kids (he had been a teacher and counselor who had a wonderful gift for bringing out the best in young people). What started with about 10 people on the beach has grown to be a major yearly event that has brought people together from as far away as Canada, Florida, and Minneapolis. Last year, 700 people and at least 345 doodles gathered in Dewey. 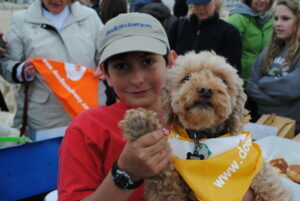 Since 2005, Doodles in Dewey has donated over $30,000 to Food & Friends. The 13th annual Dewey Beach Doodle Romp will be held Saturday, April 28, 2018, from 10:00 am – 4:00 pm (earlier for set-up volunteers). Auxiliary events begin with a “yappy hour” Friday evening. For more information and to register to participate, check out their website at www.doodlesindewey.org. Be sure to stop by the Food & Friends table to say hello! To volunteer at this event, please call Johnny Pitchford at 302-362-2688. Thank you!